--How to Write an Essay. 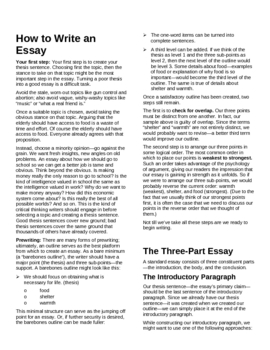 This is an eight-page document explaining many of the fundamental principles of good essay writing. --How to Write an Essay Classwork. Divided into three sections. --How to Write an Essay Classwork--Answers. --How to Write an Essay Tests. Divided into three sections. --How to Write an Essay Tests--Answers. Among the topics covered are basic outlining; the introduction, the body, and the conclusion; thesis, topic, and support sentences; transitions, pronoun issues, and run-ons and fragments.